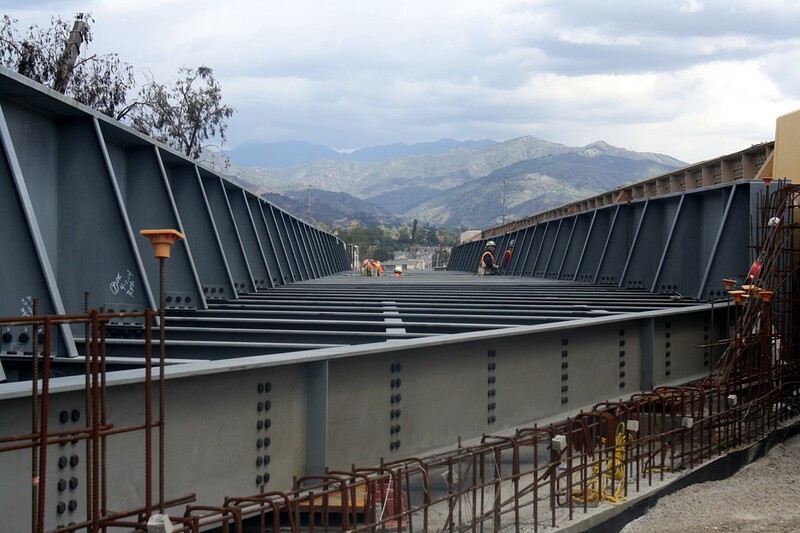 ART OF TRANSIT: Looking north to the San Gabriel Mountains from the bridge that will carry the Gold Line Foothill Extension over Foothill Boulevard in Azusa. Awesome photo by Gold Line Foothill Extension Construction Authority. A look at the activist group’s “strawman proposal” for a half-cent sales tax increase they would like to see on the Nov. 2016 ballot; please note that Metro hasn’t decided to pursue such a tax yet although is surveying cities about their own desired projects. In any case, Move LA wants to see a 45-year sales tax increase with 30 percent of the funds dedicated to new rail and bus rapid transit projects — which they say would raise $27 billion over the life of the tax. As Streetsblog notes, Move LA says their proposal is intended only to spur discussion and they include some projects for potential funding. Some are projects receiving seed money from the present Measure R (Sepulveda Pass Transit Corridor, South Bay Green Line Extension) while others are new such as converting the Orange Line to a rail line, extending the Green Line to a junction with Metrolink in Norwalk, extending the Gold Line to San Bernardino County, extending the Crenshaw/LAX Line to Wilshire Boulevard, extending the Purple Line to Santa Monica from its future terminus at the West LA VA Hospital and extending the Eastside Gold Line Extension to both South El Monte and Whittier instead of just one of those. If such a tax goes forward it will certainly be interesting to see how much is allocated to paying for new transit projects and which projects. As Move LA’s list shows, there are certainly some worthy candidates out there that would travel through many different parts of the county. And there are certainly parts of the transit network with holes in it. Stay tuned! Writer Eric Jaffe points out that several large agencies in the U.S. are currently pursuing fare increases (including Metro). And that’s not surprising: using data from a new federal report, Jaffe says that most agencies have seen the cost of providing bus and rail service rise substantially since 2000 while allowing fares to lag behind — often for good reasons (affordability, mobility, etc.). A lot of the cost appears not to come from employee salaries but rather the cost of employee benefits, which I’m guessing really means health care. It’s a national problem, Jaffe writes, and there doesn’t appear to be a neat solution on the near horizon outside of fare increases. The political columnist concludes his column by asking whether construction should even begin on a project this year that may never have the funds to complete a link between L.A. and San Francisco or even the San Joaquin Valley. He also neatly lays out some of the current issues on the table, many involving legal challenges as to whether the project fulfills requirements in a 2008 bill that allowed the bond measure to go to state voters. Obviously this bears watching with one interesting but little publicized side issue: if the bullet train project hits more obstacles what happens to the part of the state bonds to help local projects connect with the bullet train? Both L.A. and San Francisco are using some of that money to fund local projects (the Regional Connector, to be specific). Fun pros and cons of 10 big subway systems around the globe (Los Angeles’ is not included) as gleamed from online reviews. Warning: the language used is not always delicate. MoveLA’s ideas sounds nice, but for the most part, a lot of them are either 1) way too expensive or 2) pie-in-the-sky. A new ballot needs county-wide appeal if it’s going to pass. Measure R had it, and it barely was approved back in ’08. –Crenshaw Line to Wilshire: serves South L.A. and Mid-City areas. –Red Line to Valley Plaza OR Sherman Way for Metrolink connection: serves the San Fernando Valley. –Gold Line to Montclair: serves the San Gabriel Valley. –Green Line to Norwalk Metrolink Station: serves the eastern zone of South L.A.
–Purple Line to Santa Monica: serves the west side. These five, I would say, are strong because 1) they cover a wide variety of areas, 2) will be attractive to both new and current riders, 3) offer much in the way of connections, and 4) are reasonable in terms of cost (I don’t see any of these being more than $2 billion). There are other viable projects for sure, but many of them are just too costly or complicated to build. If Measure R2 is to have a chance of passing, these are issues that will have to be taken into account. The cost of public transit rising is similar to the cost of postage stamps that keep going up, up, and up. One way politicians are looking to keep the USPS alive is to let the post office handle basic banking needs and it’s an idea that’s gaining support from both sides of the political spectrum. I think this what Metro needs to do too. Just like the USPS, Metro should look into starting their own bank. Many people who ride Metro live in places where banks aren’t near and fall prey to check cashing places and predatory lenders. Furthermore, if you become your own bank, now you don’t have to rely on third party banks who charges bogus fees like your VISA TAP Ready Card. You get to set your own rules. The Crenshaw Line to Wilshire Bl. is a great idea except the Purple Line stop has been eliminated for some reason although the MTA owns a two pieces of property at the intersection that can be used for the station. mike dunn, from what I understand lack of destinations and neighborhood opposition is why the station won’t be included. pobaza, Crenshaw Line to West Hollywood would get more support than to mid-Wilshire. Red Line would be best extended to Bob Hope airport to serve air travelers AND provide link to Metrolink. Gold Line should only be extended to Pomona since after that point the line would parallel Metrolink. Green Line extension should be to South Bay Galleria unless Norwalk drops demand an extension to the train station needs to be in a tunnel. Purple Line to Santa Monica is OK as long as its final station is below the terminal of the Expo line. Yes and the more fare increases happen the more stupid it sounds for people to pay the same price whether you go 5 miles as opposed to 20 miles. $2.25 today, it’s going to be $3.00, then $4.00, $5.00 and it’ll cost the same $5.00 just to go to your nearest supermarket or to go to the Pacific Aquarium in Long Beach. You all know distance based fares is going to happen sooner or later. Why waste your time dealing with flat rate fare increases over and over again when you can spend the money today at a much cheaper cost to move the entire system to a distance based fare format? The more you delay it, the more costly it’s going to be do it later. Haven’t you guys learned anything from the fare evasion fiasco? Lack of planning and lack of foresight is something that plagues Metro ever since its inception. MoveLA’s dream STILL doesn’t provide an all-rail single-seat ride between Union Station and LAX. One comment per blog post please. We have too many posts recently in which a couple of readers are trying to take over the entire comment board with multiple comments. “Not only does active transportation have its own dedicated 4 percent funding stream, but Move L.A. has also proposed that walking and bicycling be included in the new rail transit funding. The 4% share given to “Active Transportation” (in other words bicycles or pedestrians) should be given to Rail transit instead since Rail is already being given a 3% haircut in order to appease the bike lobby. Besides the 15% given for local returns means that any local communities that want to spend the money on bike infrastructure will be able to on their own. It would also be interesting to know exactly what the 20% given for Transit operations is exactly for (fares?? new buses, rail cars etc.?). I really don’t see a problem with running transit for profit. This is America, a capitalist nation where the drive for profits is the core of our economy. Metro and all the American transit agencies wouldn’t be in this mess if they change their attitude from being a bureaucratic government agency where fares keep going up all the time into a profit making corporation where low prices and better customer service is the norm. Look at Asia where transit is all privatized. They all have much better service and lower, fairer prices than America.